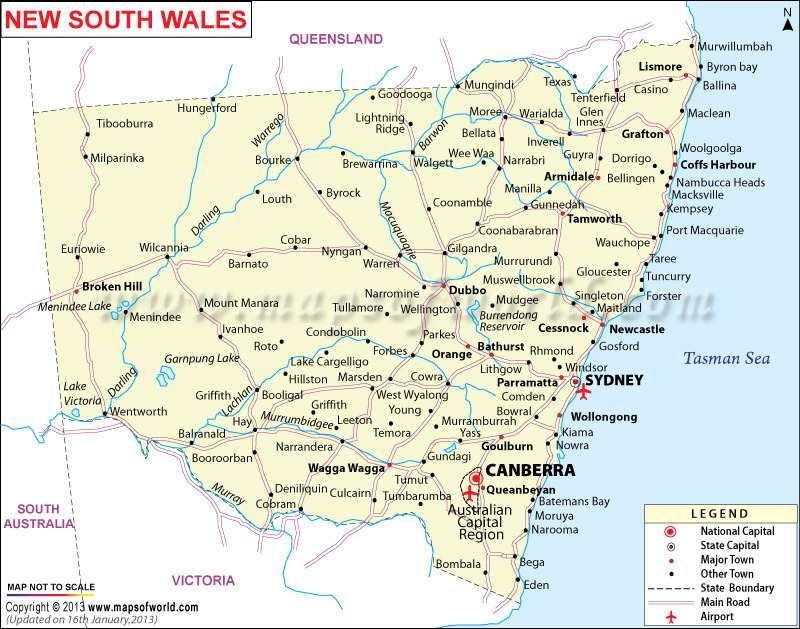 New South Wales is a state located in the eastern part of the Australian continent. It covers a total area of 312,528 square miles. The estimated population is 7.544 million. As shown in the New South Wales Map, the state is bordered by Queensland to the north, Victoria to the south, and South Australia to the west. Tasman Sea, which forms part of the Pacific Ocean borders New South Wales on the east. First discovered by Captain James Cook, New South Wales was formally established as a colony on January 26, 1788 . After more than fifty years in 1856, responsible government was granted to the colony. At the beginning of the twentieth century on January 1, 1901, the colony formally gained statehood. The administration of New South Wales functions in framework of a constitutional monarchy. The Governor of the state is the head of the state; he is the representative of the Queen of Australia. Presently, Marie Bashir is the Governor. The Premier of the state advises the governor on important issues. Barry O' Farrell is the Premier of New South Wales. The major cities of New South Wales shown in the map are: Armidale, Lismore, Cobar, Louth, Barnato, Hillston, Orange, Sydney, and Wollongong. Canberra, which is the Capital of the country is enclaved within New South Wales. It houses all the important government buildings. National Museum and National Library, Australian War Memorial, Australian Institute of Sport, and many other government agencies are located in Canberra. Covering an area of 4,689.1 square miles, and housing an estimated population of 4,575,532, Sydney is the largest city in Australia. The city is home to the magnificent Sydney Opera House, Harbour Bridge, Hyde Park, Bondi Beach, and the Royal Botanic Gardens. One of the most eclectic states, New South Wales is a perfect holiday destination. From national parks, rain forests, deserts, beaches to the historical sandstone edifices, New South Wales offers ample of recreational opportunities. The state has more than 780 national parks and reserves. The major national parks are: Royal National Park, Mungo National Park, Wadbilliga National Park, Molton National Park, and Kosciusko National Park. Mount Kosciuszko is the highest point in New South Wales. Located in the Snowy Mountains in the Kosciusko National Park, the mountain stands at a height of 2,228 meters. The New South Wales Map shows the major rivers and lakes in the state. Some of the major rivers include: Mossman River, Georges River, Dawson River, Gloucester River, Rowleys River, Richmond River, Clarence River, and Brunswick River. The state is also home to numerous lakes. They are: Lake George, Lake Albert, Lake Albina, Lake Mungo, Lake Mulwala, Lake Cowal, and Lake Wollumbola. Owing to such wonderful tourist spots, tourism becomes a significant part of the state's economy. The largest economy in Australia, New South Wales is characterized by a knowledge intensive economy. Information technology, financial services contribute to the state's economy. Agriculture is also important. The major trade partners of the state include: China, United States, Germany, Japan, New Zealand, and Korea.